I've had the pleasure of meeting Hephzibah on two occasions. I think it's fair to say we share a love of veggie friendly marshmallows. I regularly read her blog (Good for Me, Good for You) and I am excited to see she has ventured onto YouTube. Hephzibah agreed to take part in my Holy Grail blog series and she has shared with me her favourite products. Keep reading to see what she has to say about the three items pictured above (two of which happen to be my favourites). Bodhi Desert Rose Revitalising Facial Oil: This is perfection in a bottle. It might seem like an overstatement, but the silky feel as it goes onto your skin, the beautiful scent... and the smooth happy skin it leaves behind make this one of my top products. I am onto my second bottle and have no doubt that I will invest in a third. I say invest because it is £38 for 15ml, which is at the higher end of my pound pain threshold, but it is so worth it. Okay, off my soapbox now... and onto probably my ultimate HG item. 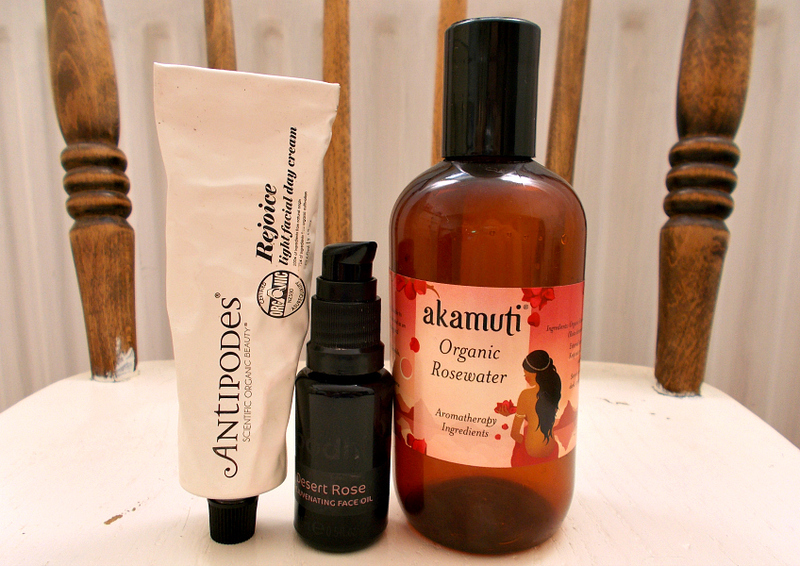 Akamuti Organic Rosewater/Orange Blossom Water: It's not a fancy item but it's one that I can't live without. I have repurchased these floral waters multiple times and currently have a glass bottle graveyard collection on my windowsill. I was thrilled to see that they've brought the rosewater out now in a mega size, although this one is in a PET plastic bottle rather than the pretty glass. I'm currently testing out a different toner/water and it's working okay, but I'm still longing to have this back in my collection as it's perfect for refreshing during the day, clearing the last traces of oil or balm cleansers, waking up the face in the morning and a multitude of other things. I probably should try to limit the amount I use as I do get through it relatively quickly - but at only £12 for the 200ml bottle, I'm not worrying about it. Antipodes Rejoice Day Moisturiser: This is probably the only true moisturiser I have in my collection. I have a lot of serums and oils but this is the only traditional cream I use. I found it and stuck with it because it works: it doesn't seem to irritate my clogged pores, it sinks in well and it smells delicious. I ran out of this recently when a tube went walkies and I really missed it when it wasn't there - my skin routine doesn't feel complete without it and I was loathed to put anything else on my face. There may be a time when I find a moisturiser that works even better on my dry patches, but for now, this is the one for me. I still have to try that akamuti water! These look amazing :) I love facial oils so much and especially love natural and organic skincare!